Have you had problems finding an SMTP server to use to send emails from your data logger? Are compatibility issues causing you to look for a work-around? Keep reading for a solution that may be just what you need. In 2006, we added the ability in our operating systems for IP-enabled data loggers to send emails using a function called EmailSend() This function opened up a whole new world, giving our data loggers the ability to issue notifications about the status of a station, transfer data files as attachments, or alert someone about an alarm condition. Over the years we have found that users often have a problem with finding an SMTP server to use. Many customers rely on publicly available free services such as Gmail or Yahoo, but increasingly, these services have added restrictions that prohibit data loggers from sending emails. Sometimes the fix requires digging through settings to change in the free account, sometimes the fix requires bribing the "IT guy" to make network changes, and sometimes, it can’t be fixed at all. With EmailRelay() you can send up to 100 emails each day, and each message can be up to 1 M in size (size includes the message overhead, the message itself, and any attachments). The message count is reset on a daily basis. Tip: When creating and testing a program using EmailRelay(), make sure to use a manual trigger to run the EmailRelay() function, and to set that trigger back to False after execution of the function. This ensures you won’t exceed the daily email limit during the first test run of your program. Here's a quick test program to get you started. Just change the constant ToAddr to send an email from your data logger to yourself. Message = Message + "This is an automatic email message from your friendly datalogger named  " + Status.StationName + ". " Message = Message + "An alarm condition has been triggered. " Tip: Run EmailRelay() in a SlowSequence, as shown above, to avoid the delay of critical measurements and other important tasks executed in the main scan. The From Address of the email sent by the data logger is emailrelay@konectgds.com. Konect GDS is Campbell Scientific's cloud-hosted data collection platform. It is also where the Campbell Scientific email server is hosted. 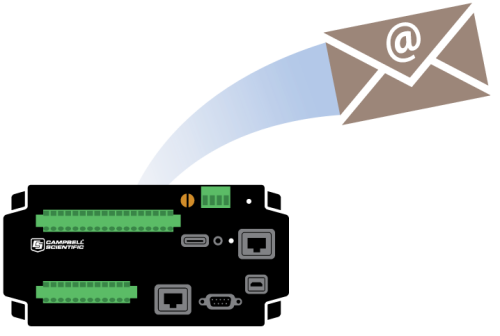 EmailSend() is still included in the data logger operating systems. If you are already using the EmailSend() function and it works well for you, there is no need to change. However, if you have struggled with compatibility with your existing SMTP server, give this new function a try. We hope you will find it easier to use. If you have comments about this new function in the data logger operating systems, leave us a note below! When you download an OS from our web site you need to run the executable to update your CRBasic instructions and Help files. Once you do that you will see EmailRelay() in the instruction list. CRLF is a carriage return line feed. Back in the old days of typewriters, when the typing mechanism (a carriage) got to the end of a line you had to return it and advance the paper (line feed). Const CRLF = CHR(13)+CHR(10) does that digitally now. Here's an article on different ways to use time to trigger an action. Thank you that did it! Dear Dana, Thank you for implementing this new function, we found it very useful. We would like to know if there is a limited number of email addresses that can be inserted in the variable "ToAddr" as for your example. Actually we are inserting 4 email adrresses and yesterday it sent the messages only to one of the adddress out 4. On which basis you calculate the threshold of 30 email per day: by email address or by data logger serial number? There are some filter on the recipients? The limit of 30 emails per day is based on the datalogger. If you send one email to 5 people, you have used up only one of your emails for the day. With the EmailRelay function, you can send to multiple email addresses at once. My first guess, without testing, is that the "ToAddr" would need to be a String variable rather than a Constant. I'm currently not at my desk to test, but I will double-check. You can also give it a go and see if you have success. I'm glad you're finding this new function useful. I think it is a great way to simplify sending email from a Campbell datalogger! thank you so much for your real time reply, much appreciated. Const ToAddr = "alessandro.materassi@cnr.it,f.sabatini@ibimet.cnr.it,....+2 recipients"
So we will try to set it as a string variable. I cannot seem to find a working version of EmailRelay through any example. Operating on a cr1000 with Std.32.03. Using the above example I obtain a -2 response. Even through CRBasic help and making a few changes does not seem to produce a result. Connection is through a RV50 modem using CSI template. The -2 response code means you don't have enough data to send yet. Just wait, and it should work. I have a situation where I want to send an email with data table as an attachment, but only once a week. My understanding is that the slowest a scan sequence can run is once a day. Is there a way of scheduling emailrelay to run once a week? The RealTime instruction loads the destination array (Dest argument) with the current time values in the following order: (1) year, (2) month, (3) day of month, (4) hour of day, (5) minutes, (6) seconds, (7) microseconds, (8) day of week (1-7; Sunday = 1), and (9) day of year. The destination array must be dimensioned to 9. The time returned is the time of the datalogger's clock at the beginning of the scan in which the RealTime instruction occurs. To trigger the event to happen every Sunday at noon. in EmailRelay function, is there any possiblity to send attachment. Keep in mind that message size is limited to 1M. This includes the message itself, any overhead, and attachments.